Successfully destroying a Dr. T event base or Imitation Game event base in Boom Beach awards gold, wood, stone, and iron. Each stage awards increasingly greater amounts of resources. This calculator makes it quick and easy to determine exactly how much loot will be won from making it so far through a Dr. T or Imitation Game event. Upon successfully defeating a Dr. T stage or Imitation Game stage, a refund of the gold cost to begin the attack is included in the gold reward. Since this mechanic nets the player no extra gold, it is ignored in this calculator. The tenth guardian input will only be shown while the masterpiece input is set to zero since the maximum number of statues obtainable in Boom Beach is ten. 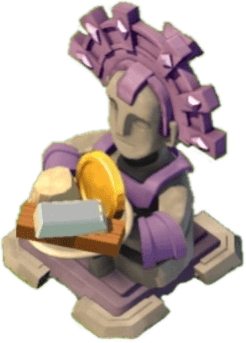 The Power Powder icon next to each statue’s input can be toggled to signify that the corresponding statue is boosted with Power Powder, and so, that statue’s bonus will be doubled in the total statue bonus. All information entered into statue-related inputs is saved to the browser for convenience. The information will be ready on return visits to this calculator.